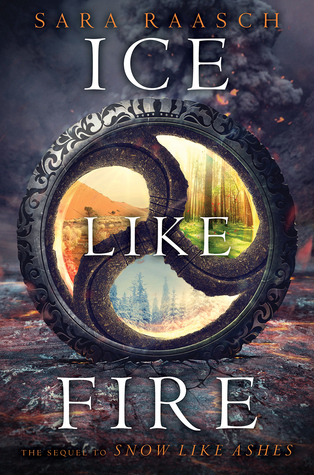 Ice Like Fire is the second installment in the Snow Like Ashes trilogy and while I enjoyed it overall, it does suffer a bit from middle book syndrome. I give it 3,5 stars, because there were some things that I really felt like they improved upon the first book and some things that just did not. The Good: We get to know the other kingdoms in Primoria, especially Summer, Yakim and Ventralli, and their rulers. This series has some exquisite worldbuilding and I loved that we got to find out so much more in this book. The Bad: The pacing was rather slow and pretty boring at times. While I loved the travelling to the other kingdoms, I did not like the complete lack of any action for the first 80% of the book. The Good: We have a POV from Mather! I really enjoyed this, because it meant we got to know him better and connect with him more. I thought the connection to Mather was pretty non-existant in book one and I think a lot of that was because we only saw him through Meira’s eyes and he was too good at hiding his emotions, which made him kind of a blank space. Seeing things from his point of view really changed that and made me start to actually root for him. The Bad: A person I did not root for that much in this book? Meira. Where did my feisty, stubborn, chakram-wielding heroine go? All I got for most of this book was a whiny, indecisive, weak girl who let others control her life. She did redeem herself near the end so I have high hopes for her in book three. The Good: We meet quite a lot of new characters, some good and some bad. I personally LOVED the character of Cerridwen, princess of Summer, a lot. She was the fierce and fiery heroine I wanted to read about in this book. There’s also a lot of backstory to her that I would love to find out more of. Her brother, the king of Summer, and the rulers of Yakim and Ventralli where equally interesting, though not always in a good way. And the Children of the Thaw were awesome and I felt like we needed more of them in the book. The Bad: Theron. What happened to you? Not spoiling anything, but I did not like the direction they took his character in at all. The same with Sir. I did not recognize either of these characters and I can only hope book three will fix them. That pretty much sums up all my feelings about Ice Like Fire. Though it had some flaws and I liked it less than Snow Like Ashes, I still thought it was good read overall and I am anxiously awaiting Frost Like Night, the third book in the series. Have you read Ice Like Fire? What did you think ABOUT IT?